The General Assembly sprinted toward the short session finish line this week with lots of activity including some legislation that affects counties. Highlights include the Governor signing a bill that helps accomplish a key goal for counties; a bill passing to restore the last day of Saturday early voting for the 2018 election after it was removed altogether in a previous bill; and both chambers sitting through hours of debate and votes on veto overrides and constitutional amendments. The legislature officially adjourned on Friday, June 29th and plans to come back Tuesday, November 27th. When the legislature adjourns the short session, the body normally adjourns sine die (meaning “without day”) and then returns in January of the odd-numbered year following the November general election to begin the new biennium. However, the legislature will return in November following the general election. While it is likely the General Assembly will write enabling laws authorized by any constitutional amendments that voters approve in the general election, the adjournment resolution would allow practically any item to be considered, including items counties successfully opposed throughout the biennium. The following is the latest on each of the six constitutional amendments considered this week, as well as an update on some legislation affecting counties. The NCACC’s government relations team will soon issue its final 2018 session report, which will detail the status of county legislative goals as well as legislation affecting county government. The Governor signed House Bill 1031 into law this week. The legislation partly addresses a priority legislative goal for counties to repeal school board lawsuit authority. The new statute repeals the lawsuit authority for school operations funding and instead continues the required joint meeting and mediation process which is followed by a funding formula triggered if the county and school board cannot agree during mediation. Under the law, school boards may still sue counties over capital funding, and stakeholders will meet during the interim to work toward alternative dispute resolution methods for capital. NCACC thanks Governor Roy Cooper for signing House Bill 1031 along with Senator Tommy Tucker and Representative Craig Horn for their leadership and efforts guiding the bill through the legislature. On Monday through Friday, all sites must be open from 7 A.M. to 7 P.M. The legislation passed the Senate and the House on Thursday afternoon, and is on its way to the Governor for his consideration. The following summaries review the status of bills proposing constitutional amendments. All six will appear on the general election ballot this November. Amended by the House, and accepted by the Senate, to raise previous proposed cap from 5.5 percent to 7.0 percent. The current constitutional income tax rate cap is 10.0 percent. Affirms the right to hunt, fish, and harvest wildlife in the state. Removes Governor’s authority to make appointments when certain judicial vacancies occur. Requires vacancies for the Court of Appeals and Supreme Court to be filled by nomination to a Nonpartisan Judicial Merit Commission, which then provides selected nominees to General Assembly. The General Assembly recommends at least two nominees to the Governor, who selects the “best qualified” to fill the vacancy. The Commission is nine members with appointments allocated between the Chief Justice, Governor, and General Assembly; no entity can have a majority of appointments, and enabling legislation is required to assign these appointments. Judicial appointees would hold judicial office until the election after the next General Assembly election. The Chief Justice or General Assembly would fill a vacancy in certain circumstances. Requires a photo identification to vote and requires the General Assembly to enact laws governing photo voter ID which may include exceptions. Would not apply to mail-in absentee voting. Amends the rights afforded to victims of crimes, which are currently enumerated in the State Constitution. The right to “reasonable protection,” provision, which was listed in early versions of the legislation, is not included in the ratified version. Removes Governor’s authority to appoint members to the Bipartisan State Board of Elections and Ethics Enforcement (NCSBE). Replaces the current NCSBE with a reconstituted Bipartisan Board of Ethics and Elections Enforcement that would instead have eight members appointed by the General Assembly as follows: four from the House with two nominations each from the majority and minority leaders; four from the Senate with two nominations each from the majority and minority leaders. Gives legislature the authority to control the responsibilities of and appoint members to all state boards and commissions prescribed by law. 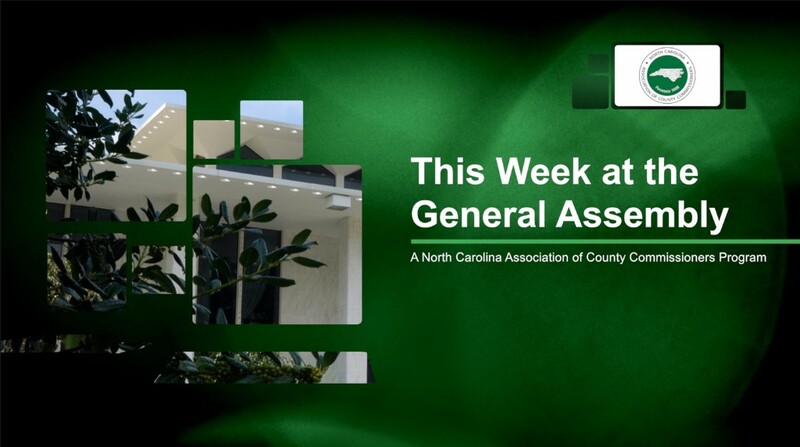 You can click here to view the most recent episode of This Week at the General Assembly, the NCACC's made for government television show on legislation affecting county governments in the North Carolina General Assembly. PE-1: Seek legislation to establish a new state-county partnership to address statewide public school capital challenges -- including but not limited to maintenance, renovation, construction and debt -- through a dedicated, stable funding stream that is consistent from county to county and sufficient to meet the school facility needs of all 100 counties. PE-2: Seek legislation to repeal the statutory authority under N.C. Gen. Stat. 115C-431(c) that allows a local school board to file suit against a county board of commissioners over county appropriations for education. TF-1: Support efforts to preserve and expand the existing local revenue base of counties, and oppose efforts to divert to the state fees or taxes currently allocated to the counties to the state. Oppose efforts to erode existing county revenue streams and authorize local option revenue sources already given to any other jurisdiction. GG-3: Seek legislation, funding, and other efforts to expand digital infrastructure/broadband capability to the un-served and under-served areas of the state. PE-4: Support legislation providing flexibility to align K-12 and community college calendar. Copyright © 2018 North Carolina Association of County Commissioners, All rights reserved.